Sunday, Sept. 11, at 4 p.m.—KILLINGTON—A good messy time is guaranteed to be had by all this Sunday, Sept. 11, at Moguls Sports Pub from 4-7 p.m. It’s that time again to pie some local celebrities and raise money for Chase Kuehl and the Phelan-McDermid Syndrome Foundation (PMSF). Chase Kuehl is one of only 1,400 children worldwide diagnosed with this disease. The prevalence of those with Phelan-McDermid Syndrome is estimated to be between 1 in 20,000 babies born. There is no cure, but it is PMSF’s goal to find effective therapies to help those with PMS, and, eventually, a cure. Last year the event raised $3,000. This year, in an effort to raise even more money, a silent auction and raffles have been added. Of the money collected, 100 percent of the proceeds go to Chase William Kuehl and PMSF with a 50/50 split. For $22, attendees will get to pie two people in the face with a whipped cream pie. (The $22 charge corresponds to the disease, which is a deletion of chromosome 22.) For those who’d like to make a bigger mess, organizers have brought back the “golden pie.” For $50 this is an opportunity to smack someone with a real juicy blueberry, cherry or pumpkin pie. There is no limit to the number of people attendees can pie, just bring cash or check to support the cause. Moguls will supply all the ingredients and 22 local celebrities attendees can choose to pie! For those that can’t make it to the event but still want the satisfaction of pieing someone in the face and helping to raise money, visit “3rd Annual Pie in the Face for Chase” on Facebook where there is a link to pie people from afar and watch it live on Facebook. Last year saw a president among the local celebs; this year it’s a chief. Whit Montgomery, Killington’s Chief of Police, will headline the Freshman class for this year’s event. It does not get better than that! When will you have another opportunity to pie the Chief of Police? When asked to be in it Montgomery jokingly said, “As long as there are no rocks in it.” He’s safe there, but this is like a college hazing in the old days with no end in sight. The rest of the 2016 Freshman class are: Heather Grev Livesey, Kaitlyn Hummel, Ed Kelly, Jeremy “Creeper” Rayner, Tucker Adirondack, Shelby Barsalou Jones, Matthew Hauck and Team Canada’s Kato. Returning for their Sophomore season are: Jared Hall, Chandler Burgess, Karri Barrett, Don Sady, Amy Fuller Ahlberg and Chase’s sister Karena Kuehl. The originals of this event who now are in their Junior year are: Chase’s father Rick Kuehl, DJ Dave Hoffenberg, Kelly Spear, Team Canada Captain Peter Whittier, Colleen Collord, Sal Salmeri and Sasha Parise. Those are the ‘lucky’ 22 chosen to be pied to help Chase Kuehl. A few years ago when the ALS ice bucket challenge was sweeping the nation and raising awareness for ALS, Rick Kuehl got the idea to start a pie in the face challenge for PMSF. He challenged a few others and one of those was me, Dave Hoffenberg. I decided instead of pieing myself in the face and only raising a few dollars, I would turn it into an event and raise a little more money. I got seven of my friends to stand up and get pied with me. Those seven are this year’s Junior class, plus Linda Ross. We increased those eight people to 22 last year and this year there are 22 again. The community really comes together for this event. The people I’ve asked happily agree to get pied over and over. 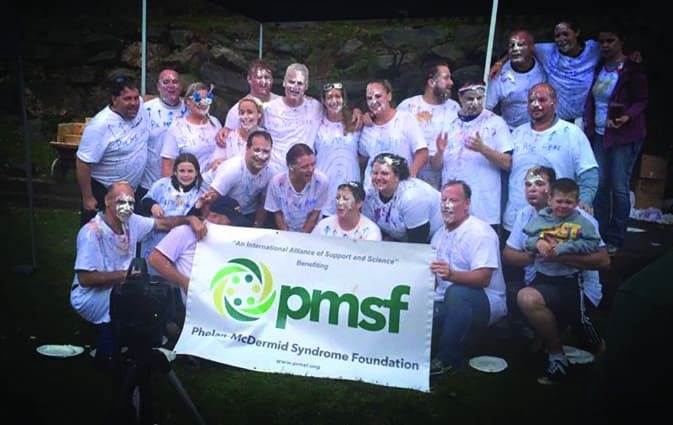 The Phelan-McDermid Syndrome Foundation (PMSF) is the leading non-profit organization in the world that advocates for those affected by the rare genetic condition called Phelan-McDermid Syndrome (PMS). Their mission is to offer family support, facilitate research and raise awareness of PMS. They are committed to connecting families, researchers, decision-makers and stakeholders and advocating for the special needs and rare disease communities. Phelan-McDermid Syndrome (PMS) is typically caused by deletion, or loss, of the terminal segment of the long arm of chromosome 22. The loss may result from a simple deletion, an unbalanced translocation, a ring chromosome, or other structural change. In the majority of cases, the SHANK3 gene is lost or mutated as a result of the deletion. The SHANK3 gene, which codes for the shank3 protein, is found in the brain, heart, kidney and other organs. Its most important role is in the brain. It supports the structure of excitatory synapses and is involved in processes crucial for learning and memory. It also has an important, if not fully understood, role in proper brain development. Defects of the SHANK3 gene are highly associated with autism. Individuals with Phelan-McDermid Syndrome often have autism or autism spectrum disorders. There is a wide range of severity of symptoms observed in people with Phelan-McDermid Syndrome. Like other autism-related syndromes, PMS is associated with intellectual disabilities, sleep disorders and seizures. Most children with PMS have moderate to severe delays and often do not develop functional language. Behavioral issues may stem from autism (e.g., repetitive behaviors), from poor communications skills, or unknown origin. The 22 local celebrities at last year’s event pose for a photo, many still messy with whipped cream pies in their faces.